So you have decided to go to Walt Disney World…and it’s totally last minute! Perhaps it’s a holiday, a long weekend, a business trip, or maybe you just need a Disney World fix. Maybe you’re trying to catch Ellen’s Energy Adventure or the Great Movie Ride one last time before they close for good. Even though many folks spend months planning a trip, you can plan yours in as little time as you have, as long as you’re organized. This article will take you through the planning and decision-making process step by step for a truly magical last-minute Disney trip. Ready to get planning? Let’s get started! 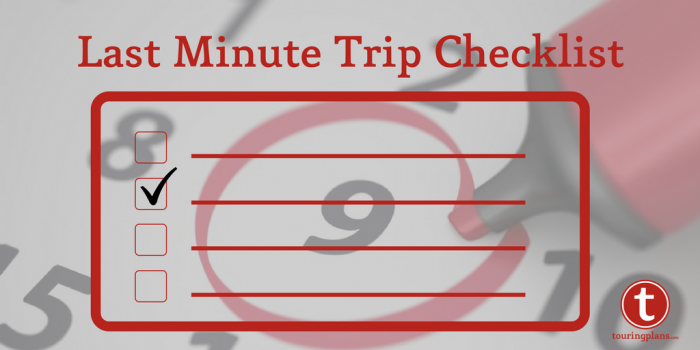 Before you commit to a trip, you may need a quick reality check. Make sure you can get time off of work, or that kids aren’t missing crucial schoolwork if you plan to take them out for a day or two. Make sure if you have pets that you can find someone to take care of them. Check to make sure that, if you have appointments on the calendar, they can be rescheduled. In short, make sure that your vacation is a vacation and not just a series of stresses. Also decide who will be handling the planning and logistics. A travel agent can certainly help, even with last-minute vacations, and that can mean a lot less to worry about. What’s my budget? How much am I willing to pay to make this trip happen? Because of the laws of supply and demand, limited choices for both transportation and lodging can make the price of your trip skyrocket. Only you know what your trip is worth to you. Also, what am I trying to accomplish? Is this a leisurely visit to a single park? Am I going to try and do four parks in one day? Will I only be able to do everything I want to do if I use Extra Magic Hours (and so I would need to stay at a Disney resort hotel)? Can I stay offsite and still do everything I want to do but save a few dollars and have more options for hotel choices? When is my trip? This is another way of asking “just how last minute are we talking?” In the days of folks making dining reservations 180 days in advance, FastPass+ reservations 60 days out, and planning a wardrobe of 5 days of matching Etsy custom t-shirts for the whole family, this could mean next month, this weekend, or “I’m driving right now.” But don’t worry, whatever the situation, you got this. When am I going home? In other words, how long am I planning on staying? The length of your trip will affect your budget, where you want to stay, and how much you can do on your last-minute trip. It also may influence your hotel options. Your resort of choice may not be available for consecutive days during your trip, so be prepared to be flexible. Is a split stay an option to consider, or do you want the same hotel (even if it isn’t your first choice) for the entire length of your trip? The most important questions you need to answer in your planning are: How am I getting to Walt Disney World? and Where will I stay? Why are these questions so important? Because if either of these can’t be answered, your trip won’t happen. In busy times of year, there may not be a hotel with an option within your budget available at the last minute. A good way to approach this is to work in two browser windows, one for your hotel and one for your flight (if you’re flying) to keep everything lined up before you make a non-refundable purchase. The distance you live from Walt Disney World is probably the biggest factor in how you will arrive at the resort. For a short weekend trip, unless you’re fairly close, you’ll probably want to fly to maximize the time having fun versus the time in transit. On the other hand, the number of people traveling with you can make a big dent in your travel budget – driving with 4 people in the car costs the same as a solo driver, but the same trip flying will cost you four times as much. A good way to figure out your best option is to note the time and money each will cost, and decide which is the best combination for your trip. 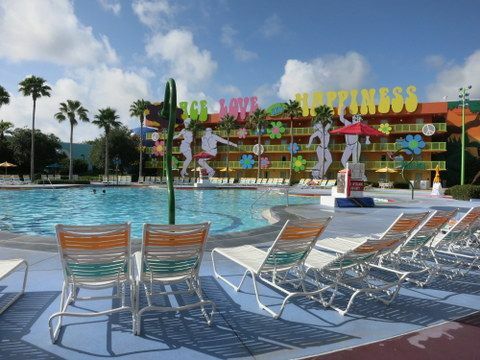 The value resorts can be a good money-saving option for many guests. What airport are you arriving at? Can you make the trip without a motel along the way or will you need to stop for food or lodging. If so, you’ll need to budget for both of these. Pro Tip: book your interstate motel ahead of time or risk being out of luck when the need to sleep overtakes you. We’ve seen families who had to sleep in their cars when they didn’t. Once you arrive at Walt Disney World, where will you stay? Walt Disney World offers four resort categories to choose from: Value, Moderate, Deluxe, and Villas. Value Resorts are basic but affordable, Deluxe Resorts are luxurious and expensive, and Moderate Resorts fall somewhere in the middle. Deluxe Villas are connected to the Deluxe Resorts but are part of the Disney Vacation Club. Fortunately, you don’t have to be a DVC Member to book a stay. Transportation costs, resort rates, room availability, and how many are in your traveling party will certainly impact which Disney Resort you choose, or if you choose a Disney Resort at all. If you stay off property, you need to consider how you will get to your resort from the airport and around Walt Disney World. Will you rent a car? How much will transportation add to your vacation costs? Don’t forget to include the price of parking at the airport back home (or transportation to and from there). 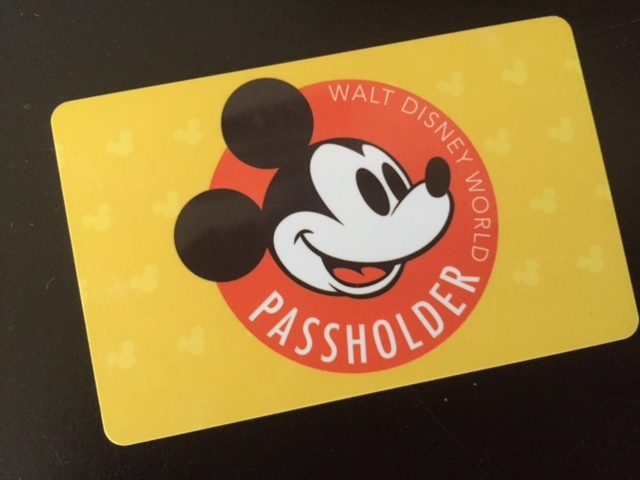 Also remember that if you’re staying off-site and are not an annual passholder, you will have to pay for parking each day if you drive to the parks. For transportation to and from the airport to your hotel, Magical Express is a free option, but only if you are flying into MCO and staying at a Walt Disney World resort hotel (with exceptions like the Swan, Dolphin, or Shades of Green). With a last-minute trip, you may not have time to get luggage tags for Magical Express, so you’ll want to pick up your luggage to take with you on the bus. If Magical Express is not an option, you’ll want to look at options like Uber/Lyft, taxis, or car rental. You can read an article exploring the costs of these options here. If your resort or hotel of choice isn’t available for your dates, or you’re looking to save some cash, consider browsing third-party sites such as Orbitz, Hotwire, and Priceline. At times, they offer availability that Disney World does not, as well as promo codes and discounts. Sometimes you don’t need another reason for going to Walt Disney World other than you want to go to Walt Disney World. Other times, there may be a specific reason for going. Want to see the new Happily Ever After fireworks show at Magic Kingdom? Eager to see for yourself if Pandora lives up to the hype? Feel the need to say goodbye in person to the Great Movie Ride or Ellen’s Energy Adventure? Making a trip for an Epcot festival? I encourage last-minute guests to prioritize their trip to-do list. It’s impossible to see and do everything at Walt Disney World, even if you had years to plan. So to avoid sprinting from attraction to attraction, leaving exhausted and disappointed, make a list of trip priorities. Know what characters, attractions, and dining experiences that top your to-do list and focus on securing FastPass+ for those or carving out time to enjoy those. Any extra time you have can be spent on other attractions or grant you the freedom to be spontaneous. The little unplanned moments often make the best memories! Now that you know how you’re getting to and from Walt Disney World and where you are staying, there’s a handful of other logistics questions to think about when planning a last-minute trip. Do I need to buy park admission? What Tickets Do I Purchase? Do you plan to park hop or visit one park per day? How many days will you spend visiting the parks? Tickets for one park per day, or 1-Day Base Tickets, are cheaper than the Park Hopper Option but operate on a tiered pricing system of Value, Regular, and Peak. So if your last-minute Disney trip is during a holiday or busy time of year, you will pay peak prices. The TouringPlans Crowd Calendar shows the predicted crowd levels for your dates and the respective price tier. Your choice of ticket may depend on your budget, but it may also depend on your travel plans. For a short visit, I would suggest a Park Hopper in order to see the best of all four parks in a short period of time. 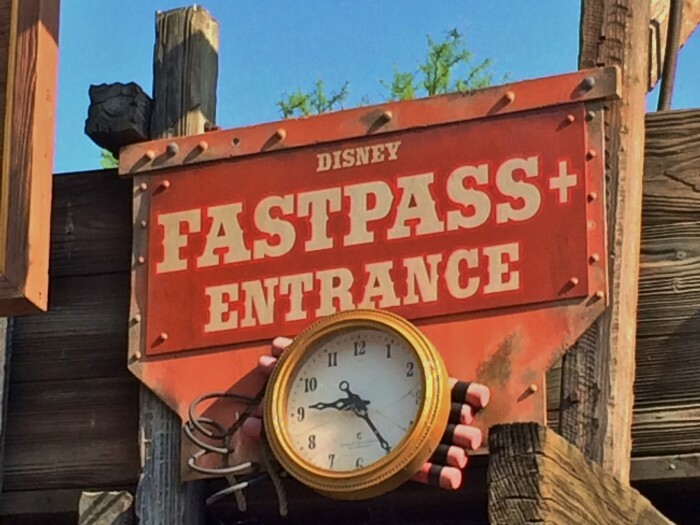 A last-minute Disney trip, particularly over a weekend, holiday, or during the summer months, may mean limited availability for FastPass+ selections and reservations for popular restaurants. This is why I recommend booking these reservations online or through the MyDisneyExperience app as soon as you purchase your park tickets. Since you don’t have months to plan your Disney trip, download the Lines app and allow it do the planning and strategizing for you! The Lines app offers customizable touring plans or schedules for each of the Disney World parks. You pick what you want to do, plug in FastPass+ selections and dining reservations, and the touring plan will adjust accordingly and offer the best park schedule designed to save you time in line. The Lines app also informs users on what parks to visit or avoid on a particular day, as well as the actual wait times for park attractions, and current restaurant and food kiosk menus and prices. Also be sure to download the MyDisneyExperience app to make or change FastPass+ reservations or dining reservations on the go. The app also offers step-by -tep directions on property, plus the locations of the shops, restaurants, bathrooms, and more. With these two apps, you can literally plan your vacation on the way to the parks! Remember to bring your MagicBands with you. Prepping for any vacation can be overwhelming, even more so when you don’t have much time between booking and departure. You may think making lists will just take up time that you don’t have. But trust me, making a list of what to do before you leave and what to pack will keep you organized and lessen your chances of forgetting something important. Before leaving on your last minute Disney trip, remember to complete online check-in for your flight and for your Walt Disney World Resort. Also, if you plan on using Magical Express, make sure you book a reservation and receive a confirmation number. 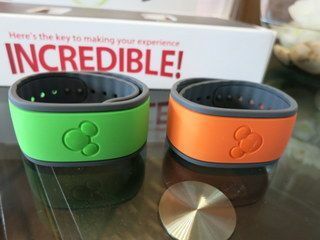 If you already have MagicBands that are associated with your My Disney Experience account, pull those out of the kitchen drawer or wherever you stashed them after your last trip. Match them up with everyone in your party and make they’re still on your account. If this is your first trip or you don’t have bands, you’ll get them at check to your Disney resort if you’re staying at one. You don’t need bands to enter parks or use FastPass+ – you can use your park tickets as well. Guests who book their trip in advance can scan their MagicBands at the Magical Express kiosks at Orlando International Airport to board their Magical Express bus. If you don’t have a band, you’ll need your trip documentation to board. 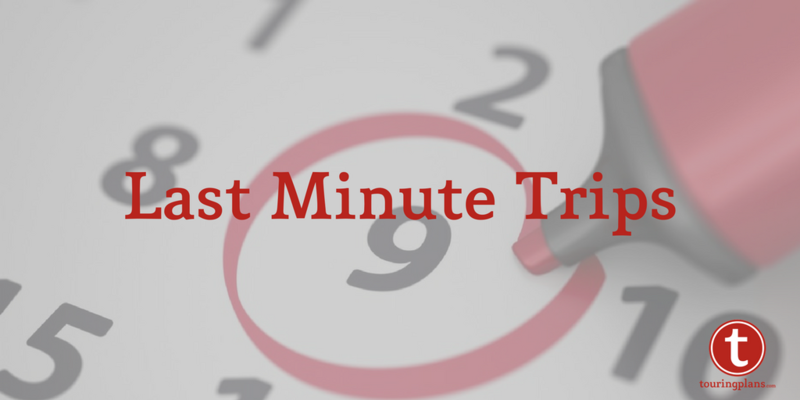 Have you ever booked a last minute Disney trip? Share your experience and your tips!